Knowing your personal strengths makes you stronger! but Doug had us in the palm of his hand!" Doug Smart is a dynamic, funny and motivational expert on personal strengths. He has taught 1,000,000+ people worldwide (from top executives and business owners to newly hired front line employees) how to discover and master their personal strengths for leadership, team building, handling change, communication, and increasing revenue. Plus, knowing your personal strengths ensures greater success, accomplishment and joy. Doug works via keynotes, training programs, consulting, seminars, webinars, assessments, coaching, books, articles and his radio show "Smarter by the Minute". You get a professional who will take the time to understand your group. Doug will interview 5 people you select as part of his "homework" to prepare for your meeting. ? "Our CEO was afraid we couldn't find a speaker who would understand us. But as soon as Doug finished, he told me he loved that Doug had done his homework by personally interviewing the 5 people I selected (including him). Asking to interview our people was a neat technique Doug used to make his program 'ours.' ...We laughed while learning, too. Doug was GREAT." Doug speaks at leadership meetings, team building workshops, conventions, conferences, annual meetings, all-employee rallies and client appreciation events.... because everyone, at every level, loves the rush that comes from learning how to be the best they can be by discovering and mastering their personal strengths. Customization is easy: you get to choose which area(s) of personal strengths you want Doug to focus on. Choose from: Leadership, Team Work, Handling Change, Communication, and/or Increasing Revenue. Pick 1, 2, 3, 4 or all 5 key areas for a special program that meets the demands of YOUR group! So that you receive the outcomes you want, Doug will work with you before, during and after your event. Prepare to be amazed by the discoveries coming from exciting new research on personal strengths. Doug is briefed by the top international research company on personal strengths, which means you get the best & newest(!) scientifically-validated information delivered in ways that are clear, practical, easy to use, results-generating, and life-improving. With 20 yrs' experience as a professional speaker, Doug Smart has what it takes to "WOW!" people at your meeting, from people who command the boardroom to the people who hideout in the breakroom. And he's the author/co-author of 25 books -- which means you get intelligent content + "wow" delivery. "Thanks to Doug's professionalism, energy and invaluable message, our delegates told us this was the best educational program in our association's history. Our delegates were simply 'WOWED' by Doug's three presentations." Typically, Doug speakes at events of 5 to 500+ people, both in the US and internationally for organizations the size of yours -- from multi-national companies, to medium and small businesses, as well as associations, health care, government, educaton and non-profit organizations. You get peace of mind by hiring experience. Over the years, Doug has sucessfully worked with all types of groups. He has developed the special skills it takes to deliver high value information to high level people in top level organizations. No matter who is in the audience the feedback you'll get after one of Doug's keynote or training programs will be about how much value they received, how well they connected with each other, and how much they enjoyed Doug. ALL of your successes flow from your personal strengths. So when it comes to your perssonal strengths, the more you know the stronger you grow. Click "Check Availability" (if it's visible on your screen) so we can check Doug's calendar for you. For faster service, phone Doug's office at 404 963-1374 and ask for Kelly Martin. Or email Kelly@StrengthsInternational.com. We can hold dates while you plan your event (this is a free service). .....“You were a hit! The feedback on your session was remarkable. Our evaluations came back with very positive comments about you, but they pale in comparison to the praise I heard in person. I'm so delighted we get you back in December." ....."The way Doug involved the audience in his presentation really gave them ownership and showed he had done his homework. I could not have asked for anything better!" ....."Thanks to Doug's professionalism, energy and invaluable message, our delegates told us this was the best educational program in our Association's history. Our delegates were simply 'wowed' by Doug's three presentations." Choose from 6 Fascinating, Interactive, Fun, Funny, Motivational, Smart and Results-getting Programs on Lifelong Success, Leadership and Teamwork -- or let Doug create a special program that meets your special needs. Available as keynote, half or full day, or on-going programs. Your choice. 1. "Your Personal Strengths are Your Most Priceless Possessions." Knowing your personal strengths makes you stronger. Use your personal strengths to be fantastic at what you do. Everyone has personal strengths, some of which might be hidden or under-utilized. You’ll love Doug’s fun methods for showing you how to discover and maximize your personal strengths so you can overcome your challenges and reach your goals smarter, faster and easier. And be happier. Your personal strengths -- MORE THAN ANYTHING ELSE! -- are the key to your success and happiness. Unlock your personal strengths and you’ll succeed in business (and life!) better than ever before. 2. "Leadership Styles that Work: It Pays to Know Your Personal Behavioral Strengths for Leadership in Business.” Since no two people are the same, effective leaders use their personal strengths to give the type of leadership each person on the team needs. Results: productivity & job satisfaction rise. Goals are conquered. 3. “It Pays to Know Your Personal Strengths for Leadership in the New Era.” Employees today have different expectations. So, it’s now more important than ever to learn how to use your unique combination of personal strengths to build, develop and keep a team of people who each have the right stuff for exceptional performance. 4. “For Senior Management Only: How to Take the Gamble Out of Hiring and Promoting by Discovering the Personal Strengths of Others.” You and your organization are as good as the people you surround yourself with. Based on the newest scientific research, this program shows you how to discover which prospective hires have the best combination of personal strengths needed for long-term success in the job. No more surprises! No more bad hires! Get your money’s worth out of every salary you pay! Half or full day leadership workshop for top level people involved in hiring and management decisions. 5. "Advanced Teamwork 1: It Pays for Everyone on the Team to Know Their Personal Strengths for Whole Team Success." (Based on the newest discoveries in DISC Behavioral Strengths research.) In this fascinating, interactive and fun workshop, every person on the team learns to discover and use their strengths to reach team goals -- even "impossible" goals. Blast through barriers! Quality goes up while conflict and "drama" disappear. 6. "Advanced Teamwork 2: It Pays for Everyone on the Team to Know Their Personal Strengths for Whole Team Success." (Based on the newest discoveries in WMOT Motivational Strengths research.) Your team will learn how to discover and use their personal motivational strengths to accomplish more together -- exponentially -- than any individual could alone. Team cohesion and respect soar! Tackle tough workloads, challenges and goals together better than ever! Click "Check Availability" (if it is visible on your screen) or contact Kelly Martin at 404 963 1374 or Kelly@StrengthsInternational.com to see if Doug is available on the date of your event. Doug Smart has worked with organizations like yours — including associations, agencies, organizations and businesses of all sizes (international, national, regional, state/province, and local). Health Care organizations, government agencies and non-profit groups, too, have hired Doug for his expertise and results. As an award-winning speaker, Doug has experience speaking at numerous conventions, leadership conferences and retreats, teambuilding/teamwork workshops, sales rallies, everyone-in-the-organization events, cruises, and more. I’m an expert on personal strengths. In one fascinating program (even as short as a keynote) I can show a group of 5 to 500+ how to discover and use their individual personal strengths for results. I show people how to apply their personal strengths so they are great leaders, team members, and communicators -- but even better, they are happier, psychologically healthier, and more successful people! Advanced adult learning techniques are used so you get exciting, interactive and motivational programs with original, hands-on, use-it-right-now material. People will laugh, have fun, and remember valuable information. I am a Certified Behavioral Analyst and the author/co-author of 25 books so you can be certain you will get real content that is facinating, interactive, fun, funny, motivational, smart and results-getting. NO MOTIVATIONAL FLUFF. NO FOOLISH ADVICE. NO GAMES THAT WOULD EMBARRASS ANYONE IN FRONT OF THEIR BOSS. GUARANTEED! For 3 years I hosted the motivational radio program "Smarter by the Minute," which means I know how to get your audiences energized while they have a good time. Plus, my staff and I are easy to work with, my programs are customizable, and people will thank you for hiring me. I promise! Take a look at my website, www.StrengthsInternational.com, for more info. PS: My immediate goal is to show another 1,000,000 people worldwide how to discover and use their personal strengths for success, leadership and teamwork so they are happier, psychologically healthier, and enjoy greater success in business. I'm using my personal strengths to make the world a better place. Can you help? Contact Doug about the event you are planning. After you and Doug discuss the results you want, he will show you how he can get people excited about discovering and using their personal strengths, skills and talents in fresh new ways to get the results you -- and they -- want. This is especially useful for people who are going through significant change, face stiff competition or who feel as though they are stuck and not moving forward as fast as they want to. To get started, contact Doug Smart now! If you like what Doug Smart can do, click "Check Availability" now (if it is visible on your screen) so we can check Doug's calendar for you. Or contact Doug's assistant, Kelly Martin, at 404 963-1374 or Kelly@StrengthsInternational.com. At your request, we can hold a date for 2 weeks while you develop plans for your event, finalize a budget, etc.. There is no charge for holding a date. In North America, Doug Smart’s speaker fee is $7,500 for a keynote or training program from 45 minutes to 3 hours (client chooses length); for a program between 3.5 and 7 hours the speaker fee is $10,000. There is no charge for travel or meals in the US, Canada, or Mexico, however the client is to provide at least 1 night of hotel lodging at or near the location of the meeting. In South America, Europe, Australia, Asia, Africa, or Antarctica, Doug Smart’s speaker fee is $10,000 for a keynote or training program from 45 minutes to 3 hours (client chooses length); for a program between 3.5 and 7 hours the speaker fee is $15,000. For events outside of North America, the client pays for lodging, travel, meals and incidentals (such as visa fees and work permits, if any). SPECIAL FOR MEETING PLANNERS WITH TIGHT BUDGETS: Doug might be able to barter/trade for up to half of his speaking fee. Click "Check Availability" (if visible on your screen) to find out. Or contact Doug's assistant, Kelly Martin, at 404 963-1374 or Kelly@StrengthsInternational.com. If you want Doug at your event, we will do our best to find a way to make it work. Take a moment to look at Doug's website www.StrengthsInternational.com so you get the information you need. so we can check Doug's calendar for you. while you develop plans for your event, craft a budget, etc. There is never a charge for holding a date, ever. Thank you for reading this page to the end! We want to reward you! If you are planning a meeting, email us through the SpeakerMatch message service by clicking "Check Availability" (or contact us directly at 404 963-1374 or Kelly@StrengthsInternational.com) and let us know you read this whole page. Doug will give you -- ABSOLUTELY 100% FREE, NO-STRINGS-ATTACHED, NO-PURCHASE-NECESSARY -- an online evaluation of YOUR personal strengths! And you & Doug will have a personal 90 minute coaching call. Just the two of you. You'll be able to see exactly where you excel naturally. Plus you'll learn how to create a clear path for reaching your goals (and dreams) smarter, faster and easier. SERIOUSLY -- you can learn in 90 minutes what many people take decades of painful trial and error to figure out about themselves! Doug's coaching clients pay only $595 for this service...but for you the cost is $0! This offer is not transferrable to anyone else, it is just for you as a thank you for being a diligent reader. No kidding!!! You have nothing to lose and a world to gain. We have made this offer for months and so far only 14 people have taken advantage of it. I guess the vast majority of people don't bother to read to the end of the page. Oh well, their loss....but let it be YOUR GAIN. PS: If you are thinking this is fake or that the $595 value is inflated, then just take a look at the Coaching page on Doug's website, http://www.strengthsinternational.com/career-coach/. You'll see the same info Doug's clients see, except for you the investment is zero! To get started, simply contact us now. 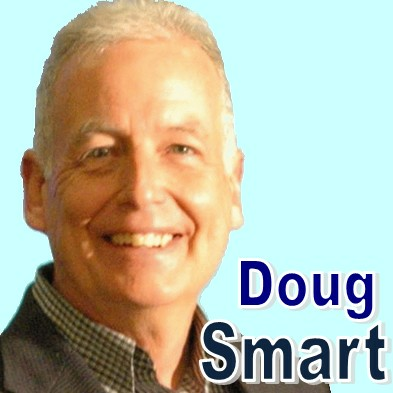 Find out more about Doug Smart - Success, Leadership, Teams at http://www.StrengthsInternational.com.